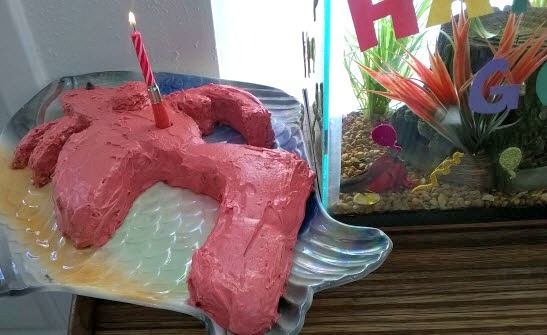 For the one year anniversary of when I got Finely (otherwise known as his Gotcha Day), I threw a party and made a cake that looked like him. It was easier to make than I thought it would be. The most difficult part was getting the frosting to spread nicely over the cut (crumbly) sides of the cake. I used recipes that I found online, but made some alterations to them (primarily so the cake would be organic), but it actually yielded a more dense cake, which was perfect for all the cut out shapes. It helped them to hold together better. It was the rice milk that was the most important change; that’s what made it more dense. Rice milk is a thinner liquid than cow milk. If the cake was less dense, the fins probably wouldn’t have held together well enough to get them cut, let alone to get them frosted. The ventral fins (the little leg fins as I like to call them) were particularly difficult because they were so thin. 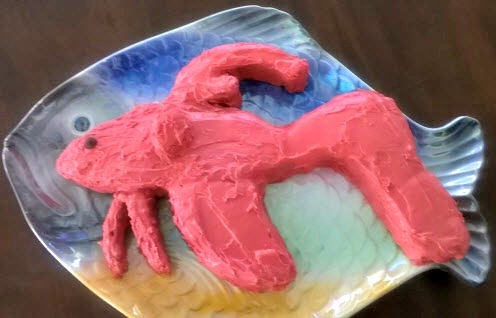 Finley is a bright red fish, so obviously I wanted the frosting to be bright red as well. To accomplish that, I decided to use pomegranate juice (because that’s what I had in the house). I followed this recipe by the Food Network for making pomegranate juice food dye, but I didn’t do it right – I waited too long from the time I made the juice paste to the time I put it into the frosting, and it was solidified. I also didn’t make enough of it. By that point I was pressed for time, so I had to use food dye. If you’re able to plan ahead, it would be easier to just get a vegetable juice food coloring kit. I just happened to have an old (not healthy) food coloring kit that I hadn’t thrown out yet. I first drew an outline of Finley. I used a picture of him to get the shapes right. This drawing doesn’t have to be large; it’s just to get an idea of exactly what shape each part of your fish is and how you will draw it. Determine which pan you will be using. I originally planned on using a rectangular pan, but realized that I wouldn’t have a platter large enough to hold the cake once all the pieces were assembled. I could have used a baking sheet, but ours are kind of old (not very nice-looking). So instead, I used a square 9×9 pan. Trace the edges of the pan on a brown paper bag or any other large piece of paper that you have. Be sure to make adjustments if your pan has a lip. Draw the shapes for your fish inside the tracing of the pan. Once the cake is cool, lay the shapes on top of the cake. Be sure that the drawings all fit. Cut out each shape from the cake using a bread knife. Start with the large pieces, then be extra careful with the small or thin pieces. Arrange the pieces on the serving platter. Trim any parts needed for the pieces to line up properly. Keep in mind that any imperfections can be covered with frosting. Frost the cake. Be gentle; the sides of the cake can get crumbly, so try to spread a thick layer of frosting over them. Add a chocolate chip for the eye. Use a cotton swab to clean off any excess frosting from the platter. It may be hard to tell, but the side fin (pectoral fin) is actually raised. For that piece, I cut out the shape of it using the drawing, then cut off the bottom at an angle so that the fin would raise out from the body. Show the cake to your fish, but cut and eat the cake in a separate room to prevent your fish from having a nervous breakdown. To see the rest of the festivities from Finley’s party, go to the post Betta Fish Birthday (Gotcha Day) Party! There’s a video too!